Best Books for Men: Why is Duck Dynasty so popular? Why is Duck Dynasty so popular? I became a fan of A&E’s hit show Duck Dynasty when I finally started watching it during the third season. Duck Dynasty is an unlikely hit cable show. 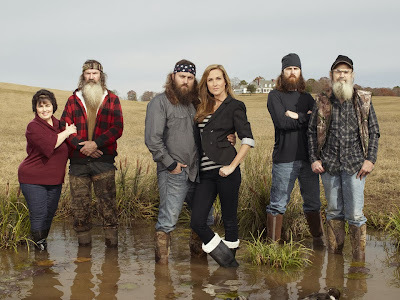 The show features a family of Louisiana rednecks who run a multimillion-dollar duck call manufacturing business. The men in the family have beards and attractive wives. They love hunting, fishing, and blowing things up. Sure, they tease each other but the love and loyalty they have for each is genuine and sincere. Each episode closes with the family praying together before their evening meal, with Willie Robertson, the company CEO, giving a voice-over of a life lesson they learned that day. Never preachy or corny, Willie’s life lessons connect with viewers on an emotional level. The first episode of season four featured a wedding ceremony for Phil and Kay for their 49th anniversary. The episode smashed previous cable TV viewing records for reality shows, with an astonishing 11.8 million people watching. I think the star of the show is Uncle Si, an eccentric Vietnam veteran who has an off-beat take on everything. Uncle Si mangles sentences but he is endearing and funny. He also released a best-selling book in 2013, "Si-Cology 1: Tales and Wisdom from Duck Dynasty's Favorite Uncle." Scenes are occasionally interrupted by younger brother Jace Robertson giving humorous talking-head commentary. So why is the show so popular? The family is humble, sincere in their faith, and genuinely funny. They know they are rednecks and don’t mind it. Hollywood usually depicts Southerners as rubes. But on Duck Dynasty, the Robertsons live out their lives using common sense, good humor, even wisdom from the Bible. They have figured out how to live successful, happy lives. This is not the Hollywood caricature of Southerners viewers usually see on TV. I’m sure many viewers wish their own family was as close as the Robertson family is. Plus, the beards and camouflage clothes - and Uncle Si’s antics - make people want to keep watching.